New Delhi, December 22: Designated as a maiden tour outside Indian waters, the Indian Coast Guard Ship (ICGS) Vikram is on a goodwill visit to the United Arabs of Emirates (UAE), and will be conducting joint training exercises with the UAE Coast Guard. The joint training exercise is a step towards enhancing the interaction and co-operation between India and UAE. The exercise include simulated search and rescue operations, law enforcement, and activities regarding safety of life and property at sea are some of the training activities that the ICG will undertake with the UAE coastal protection authorities. 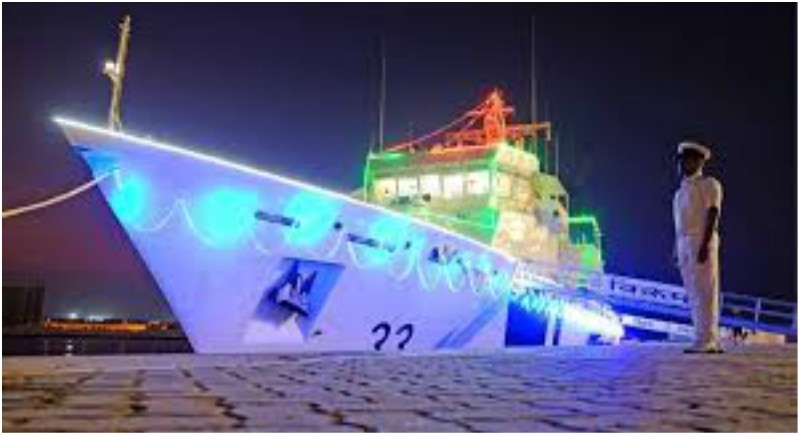 The ship injected for the joint training exercise, ICGS Vikram, is the first of its class of seven Offshore Patrol Vessels (OPVs) from India, arrived in the UAE on Friday, and will be berthed in Dubai's Rashid Port till Monday. The OPV is currently on a pan-GCC tour that started in Dammam, Saudi Arabia. The vessel's next destination is Muscat, Oman. Commanding officer of ICGS Vikram, Raj Kamal Sinha said that the vessel (ICGS Vikram) has been designed indigenously and built by Larsen and Toubro Shipbuilding Ltd. and is fitted with the most advanced navigation and communication equipment, vital sensors and machineries. On a side note, the commanding officer and the Group Captain Shoeb Kazmi, Defence Advisor, Indian Embassy said there have been several visits from ICGS vessels in the past few years, that have greatly benefitted India-UAE ties. Furthermore, the commanding officer also said that since the 26/11 attacks on Mumbai, the coast guard and the Indian government has greatly bolstered coastal security.